The title looks very much like a headline for a regional news. But as far as our situation here is concerned, it's more 'prediction' than 'news', simply because things doesn't materialise as promised anymore nowdays. As you can see in the following newspaper cutting, this was stated 3 days ago by the Deputy Chief Minister himself. Let's see about it. Feb 8, 2013: Is this for real this time? 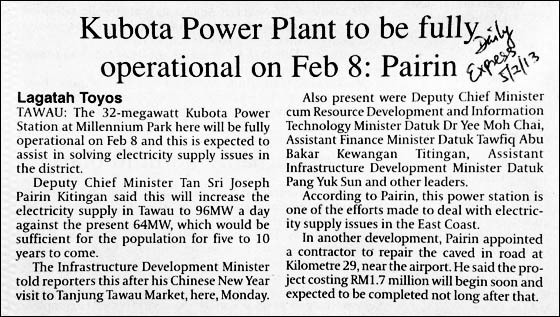 Today is 7th of February and I would like (and who wouldn't) to see that the front page of many tabloids tomorrow say something like "Kubota Power Plant is Now Fully Operational". The 64 MW Kubota station to start operation in June 2012. Back then I thought I would give it a 6-month margin before the plant start operating. That would mean December 2012 rather than June. The delay was understandable as the vessel ferrying the equipment was hijacked by pirate. On Dec 7, 2012 Energy, Green Technology and Water Minister Datuk Seri Peter Chin Fah Kui stated that the power station will begin producing electricity starting January 7, 2013. As you can see, never did it materialised. Latest is what you see in the above Daily Express cutting. That's tomorrow and I'm keeping my fingers crossed it will really happen this time. Power supply is very close to heart, at least for me, for a couple of reasons. Firstly, the place I hailed from is still without electricity despite efforts to get connected for more than 20 years. The 3 neighbouring villages are all enjoying 24 hours power supply already. Secondly, in the the industry I'm involved in, energy is one of the biggest contributors to the expenses pie. We are one of the biggest energy (electricity) users in Kota Kinabalu, and in the West Coast of Sabah. Stability of power supply is of paramount importance to us. When the power supply in the East Coast is sufficient, the situation in West Coast will be more stable, and simply put, more people will get to enjoy 24-hour electricity. So, come on guys! Don't play games with us and the rakyat. Mean it when you say it, will you! EAGERLY WAITING FOR MORE LIGHTS TOMORROW. Belum ada kabar beritalah, bro. Tabloid tempatan & SESB sendiri pun belum buat apa2 kenyataan.